Alastair Cook marked his final Test appearance with a fifty before India’s Jasprit Bumrah sparked an England collapse at The Oval on Friday. But Cook’s exit for 71 sparked a slump that saw six wickets lost for 48 runs, with England captain Joe Root, Jonny Bairstow and Sam Curran all out for noughts. Cook, England’s all-time record Test run-scorer, was making his final appearance at this level before international retirement. But he has struggled for runs lately, with his previous best score this series the 29 he made during India’s 203-run win in the third Test at Trent Bridge. “The guard of honour was such a nice gesture but you’re focused on batting and you don’t have time to appreciate it,” Cook told Sky Sports. Cook, who walked out to a guard of honour from India, struck two trademark boundaries off successive Bumrah balls — a square-cut and a pull. England were 68 for one at lunch, with Cook 37 not out and Moeen Ali — one of an all left-handed top three — two not out. “It was an unbelievable spell from Mohammed Shami,” said Cook, who completed a 139-ball fifty, including six boundaries, with a capacity crowd giving him another standing ovation. But his hopes of becoming just the fifth player to score a hundred in both their first and last Tests would have to wait until England’s second innings. 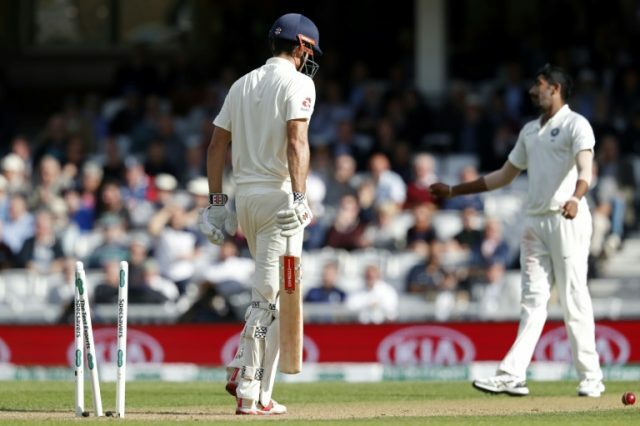 Cook’s typically patient vigil of more than four hours ended when, playing defensively, he inside-edged Bumrah onto his stumps to end a 190-ball innings including eight fours before walking off to a third ovation of the day. “Whether it kept a bit lower than your subconscious brain thought, whether I could have got forward –- I don’t know,” said Cook. Moeen, batting in England’s longstanding problem position of number three, completed a 167-ball half-century only to fall for exactly 50 when caught behind hanging his bat out against Sharma.